India has a new prime minister, and he wields an electoral mandate the likes of which have not been seen in decades. Last week, Narendra Modi and the Bharatiya Janata party (BJP) rode to power in a landslide victory that gave the party a parliamentary majority, reducing the incumbent Indian National Congress to a distant second. While the elections have been widely covered overseas, what has received significantly less attention is the impact they are likely to have on some of India's most marginalised people. Indigenous communities, or Adivasis, who comprise about 8% of the population, have borne the brunt of big "development" projects for decades. They have been forced out of their homes and lands to make way for everything from mines to power plants to dams. And their lot, unfortunately, looks unlikely to improve under the new government. Indian law falls short of international standards, which mandate the free, prior and informed consent of indigenous people in all decisions that affect them. But even these laws have not been implemented adequately. The BJP made the right noises during its election campaign. In its manifesto, the party pledged to ensure that Adivasi land is not alienated, and to develop a long-term strategy to empower these communities. In campaign speeches Modi promised to work for their welfare. There is little evidence from the ground, however, that these fine words will be followed through by the new government. States with a BJP government have behaved remarkably similarly to those where the Congress is in power – showing little interest in enforcing laws enacted to protect Adivasi rights. Facing slowing economic growth, allegations of "policy paralysis" and pressure from powerful interests, the Congress had actually stepped on the gas (or should I say coal) in its last few months in power, rubber-stamping clearances for big projects, diluting existing norms on consultation, and ignoring serious human rights abuse. The new government is unlikely to break from this approach. A mainstay of the BJP's campaigning had been its focus on easing rules for businesses. Indeed, its election manifesto expressly says the party will frame environment laws in a manner "that will lead to speedy clearance of projects without delay". 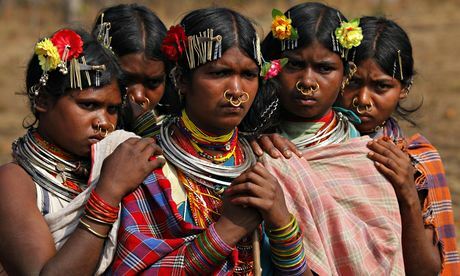 While an approach to governance that facilitates economic growth is not necessarily a problem, India's political parties have a history of putting corporate interests over the constitutional rights of Adivasis and other marginalised communities. Speedy clearance has too often been shorthand for shockingly abusive and reckless practices, leading to the further alienation and impoverishment of Adivasi families. Crucial to the future of Adivasi rights is the question of how much power the new government will give village assemblies in deciding how traditional lands are used. A draft bill (pdf) from last year proposes to make the consent of village assemblies mandatory in decisions on land and resource use in constitutionally protected indigenous territories. Whether the government gets round to passing this bill will indicate how it leans. There could be other more immediate clues too. A flawed but progressive land acquisition law (pdf) passed in January vastly improves the terms of acquisition and rehabilitation for affected communities, but excludes several important industries – including coal mining by the state – from its ambit. The law says the central government shall make it applicable to these industries within one year. Will the new government do what is needed? Also, in March, the president passed a temporary law (pdf), which made wrongful dispossession of Adivasi land a criminal offence. The law will lapse unless it is passed by parliament within six weeks from when it reassembles. We will soon discover whether the new government will follow through.